My great grandparents watching Jersey and Guernsey play football. 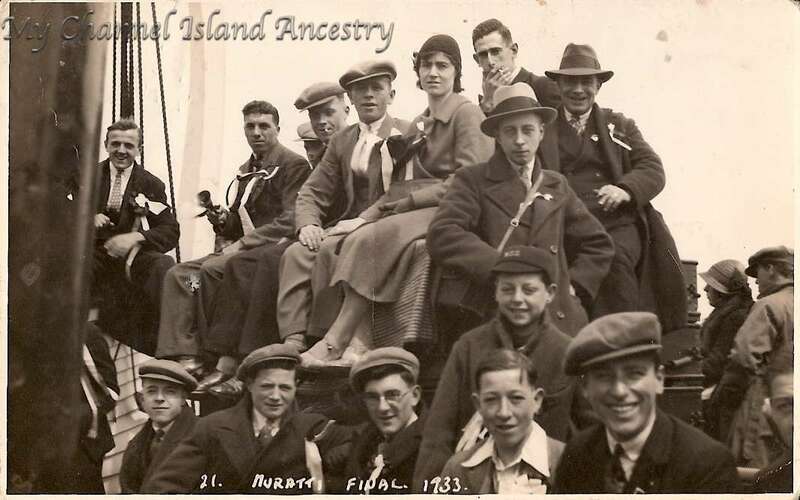 Seventy eight years ago today, on the 20th April 1933 my great grandmother Florence Anna Gallienne (sitting at the top) and her husband Henri Yves Rabet (to her right) watched the Jersey football team play against Guernsey for the annual Muratti Final. Florence is 28 years old and Henri is 30 years old when this photo is taken. By this time they have been married for 9 years and have had five children. Florence is to have sadly died only 3 years after this photo was taken. What is great about this photo is that it gives you an insight into your ancestors leisure times and social activities. The fact that they both went to watch football together shows a shared social interest (although I am presuming that Florence enjoyed watching football, I may be wrong!) It also makes sense that later on in time their son Henry (who was 3 at the time of the photo) was mad about football and played well in the school team. Henry Rabet Jr. is sitting in the front row, first on the right. Notice the date on this photo, I wonder if it was taken just before Jersey was occupied by the Germans during World War 2? 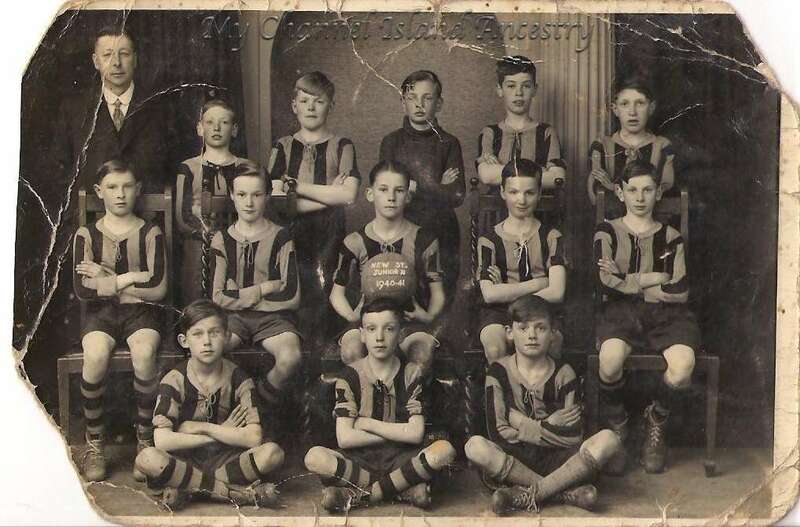 It is likely that this may have been New Street Primary’s football team (the school no longer exists). Henry was living at 45 New Street, Jersey with his father the time this photo was taken. Score: Jersey 4 Guernsey 2. Team players: R Le Tissier, E Sauvage, W Breton, N Brouard, C Guilbert, G Taylor, H Duquemin, W Stevens, R Martel, S Robert, E Le Flocq. These are the Guernsey players and I don’t recognise any family names. I couldn’t find the list of players for the Jersey team, but I will try and find them. The website was a great find as it confirmed the date of the Muratti, plus Florence’s grandfather was born in Guernsey so maybe she had family playing in one of the teams??? If you recognise anyone else in either of the photos, I would love to hear from you! Remember your great grandparents well, I was a daily customer at their little shop in New St and got absolutely everything there except fresh meat and bread ( this was in the 50’s) am I right in thinking that your great aunt Olive also worked in the shop? Long ago memories.!! The Jersey team was – Burtenshaw, Malzard, Freeman, Hitchcock, Cummins, Gamblin, O’Neill, Carpenter, Le Feuvre, Boyd & Benest. Over 2,000 Jersey supporters travelled over on the St. Julien and the Isle of Jersey. Thanks for stopping by and contributing the names of the players and correcting the date of the game.